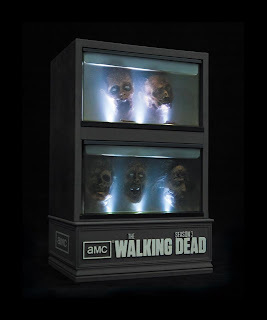 Be still my beating heart... Straight from The Walking Dead Blog we got a glimpse and the biggest craving to have this bit of eye popping candy. They sure know how to keep us wanting more! With the Walking Dead returning to us this Sun., Feb. 10 I couldn't be more excited. Now to see one of the creepiest things from the Series so far, and then tell me I could get a lil bit of that to have in my home? Shut up and take my money! Say what? Real water, lights, I can arrange them? Dudes you have me. I have always been a huge fan of McFarlane Figs and Toys, who's been a huge part in collector swag for toys and games from Halo, Medal of Honor, Spawn, to WalkingDead just to name a few. So hearing He's in on it is just more icing for my Zombie Killing Cake.